The Sailor's Return from Active Service, Thomas Rowlandson, date unknown, Metropolitan Museum of Art. 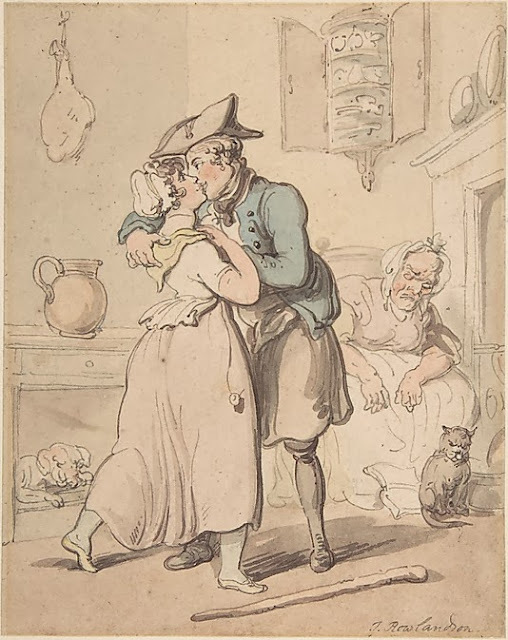 Taking up the trope of the "sailor's return," Rowlandson has a sailor courting a woman while the nursemaid snoozes on duty. This print is difficult to date. Rowlandson was especially active in drawing caricatures in the 1780's and 90's, but his first exhibition was in 1775 at the tender age of 19. Rowlandson continued drawing and painting well into the nineteenth century. We can also inspect the art itself. Consulting my wife (who knows far, far more about women's clothing in the eighteenth century than I do), the woman's clothing suggests 1780's at the earliest, but due to her apparent low class, this could be as late as the early nineteenth century. The sailor gives us a bit of a clue. Very, very few images of sailors after the 1780's wear cocked hats. I have yet to find any images of sailors from the 1790's that wear cocked hats. On that alone, we could place the image between 1780-1790. I would only do so very cautiously. Exceptions to seemingly hard and fast rules about material culture abound. It is quite possible this image is later. What do you think? Here's the entry for The Sailor's Return from Active Service on the Metropolitan Museum of Art's website. As mentioned, the sailor wears a cocked hat, with a simple cloth covered button and loop on the right side. The hat is cocked very far over, worn almost sideways. His black neckcloth is tucked into his shirt, or tied so closely that we don't see the hanging ends. There is no waistcoat, but a white shirt. Our jack's blue jacket has cloth covered buttons, but it's hard to tell if it is double breasted. It appears that the jacket is lined. Certainly there are waist pockets. His slops are off-white and we see black breeches (or blue breeches under the shadow of his slops) and black stockings. The shoes have round toes, but there is no buckle visible. This could either be a choice on the part of the artist, or the shoes tie. Neglected beside him lies his stick.